The Haverford College Department of Fine Arts is pleased to present the 2014 thesis exhibition, representing the culmination of each senior’s study at the college. 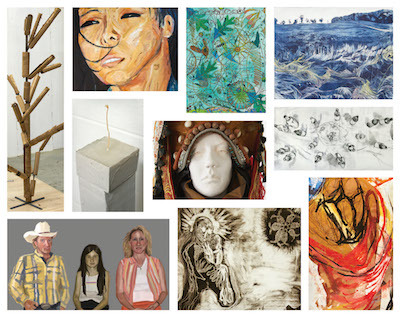 This year’s ten seniors pursued concentrations in sculpture, painting and printmaking. The exhibition reflects a wide range of approaches: large, gestural paintings of the human figure by Camila Aguais; monotypes and etchings by Deborah Matus probing abject undercurrents of Christian imagery; Shannon Murphy’s evocation of the Valley Forge landscape through various printmaking techniques; Maggie Mostue‘s monotypes and etchings exploring the emotional resonance of colorful pattern. Other projects focus on comtemporary social issues. Angel Genares’ installation investigates the personal interactions implied by a cluttered tabletop. Paintings of Shanghai nightlife by Sharon Li explore compulsions for the exotic and risky. Cara Wyant examines connections between art and science in an installation of tree-like forms inspired by genetics. Several exploit modern technologies. Rhianna Shaheen wordlessly tells the story of a runaway country girl in paintings and digitally produced images. Hilary Pierce investigates the psychic ramifications of dance with a video and costumed, three-dimensional figure. Grace Xie’s sculpture and video of a candle probe our associations with the generation and extinguishing of light. A 44-page color catalog accompanies the exhibition.